NEW YORK — The U.S. Postal Service today celebrates the life and legacy of Lena Horne as the 41st honoree in the Black Heritage stamp series during a first-day-of-issue ceremony at Peter Norton Symphony Space. 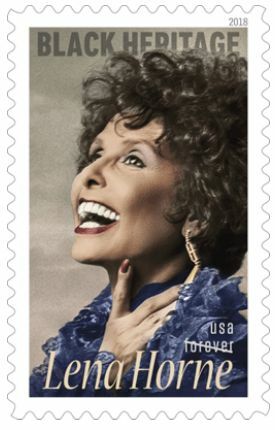 The stamp art features a photograph of Lena Horne taken by Christian Steiner in the 1980s. Kristen Monthei colorized the original black-and-white photo using a royal blue for the dress, a color Horne frequently wore. Monthei also added a background reminiscent of Horne’s Stormy Weatheralbum, with a few clouds to add texture and to subtly evoke the album title. Art director Ethel Kessler designed the stamp. Share the news of the stamp using the hashtags #LenaHorneForever and #BlackHeritageStamps. After applying the first-day-of-issue postmark, the Postal Service will return the envelopes through the mail. There is no charge for postmarks up to a quantity of 50. For more than 50, customers are charged 5 cents each. All orders must be postmarked by March 30, 2018. The Postal Service also offers first-day covers for new stamps and stationery items postmarked with the official first-day-of-issue cancellation. Each item has an individual catalog number and is offered in the USA Philatelic Publication and online at usps.com/shop. Customers may register to receive a free USA Philatelic Publication online at usps.com/philatelic . 476906, Press Sheet with Die-cut, $60.00. 476910, Digital Color Postmark Keepsake, $11.95. 476921, Digital Color Postmark, $1.65.